I read somewhere that when Bill W., the co-founder of Alcoholics Anonymous and author of its eponymous handbook (aka the "Big Book") wrote the first draft, it was somewhere between two to three times as long. After his fellows pointed out that the main audience for this book were habitual drunks and that they would be reading this book (if they could be induced to read it at all) with scrambled brains, Bill and the editorial team managed to get it whittled down to the size it basically remains today. Everything you need to understand the Steps is in the Big Book, but they reveal their intricacies rather slowly this way (even with help from people further down the path). Hence the proliferation of workshops and study groups around working and understanding the material well enough to apply it to one's actual life. 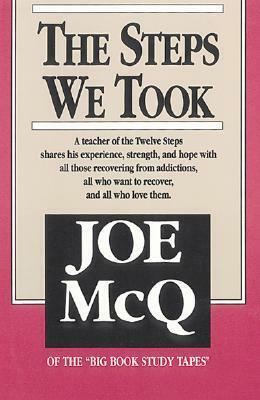 Joe McQ and Charlie W co-led a legendary Big Book workshop for many years. This book does not contain the exact contents of the workshop—those are available elsewhere online, or through that one Guy Who Knows a Guy—but does lay out the theories behind the Steps and how to work them in a terrifically clear and simple fashion. It's not official 12-step literature (i.e., approved by the AA Conference), but it's the best explanation of the Steps I've seen. Whether you have a loved one in program, are working the Steps yourself, or both (lucky you! ), you're bound to come away with a richer, more nuanced understanding of the principles that support these amazing programs, and how they are best applied. Sign into Goodreads to see if any of your friends have read The Steps We Took.